Oops! I’m so embarrassed. Safety first! Before we shop here at Bad Science Debunked, we always review our Safety Rule O’The Day. If you’re a regular here, you know that these rules always come from the people we’re actually buying from. The Huffington Post piece links parabens to cancer, and since Hyman is a golly-gee-whiz real live doctor who hardly ever sells us product he says are harmful, I suppose we’d better take his advice and avoid parabens. Right, then! We can finally go shopping! Wait. What? Methylparaben and propylparaben? 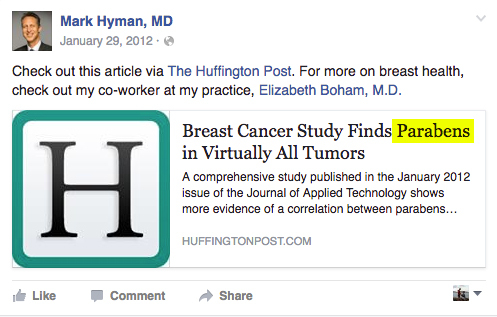 But Hyman just posted a link to Facebook that warned us that parabens were linked to cancer! This isn’t the first time Dr. Hyman has been caught with his pants down. He has previously claimed that caramel level IV coloring causes cancer, but that’s exactly the additive you’ll find in the Neuromins supplements sold via his online store. He warned that the artificial sweetener xylitol would slow your metabolism and add belly fat, but sells the supplement Endefen, which contains xylitol. Pure cane sugar is to be avoided, according to the good doctor, but you’ll find it in his $50 Pure Lean Chocolate Powder. To quote the great Winnie the Pooh: “Oh, bother!”. It’s not hard to see how poor Vani Hari (the “Food Babe”) went astray in her own career, having been caught selling nearly three dozen products containing the same ingredients she says are toxic, when she’s getting her advice from doctors like Mark Hyman, who sets such a fine example. 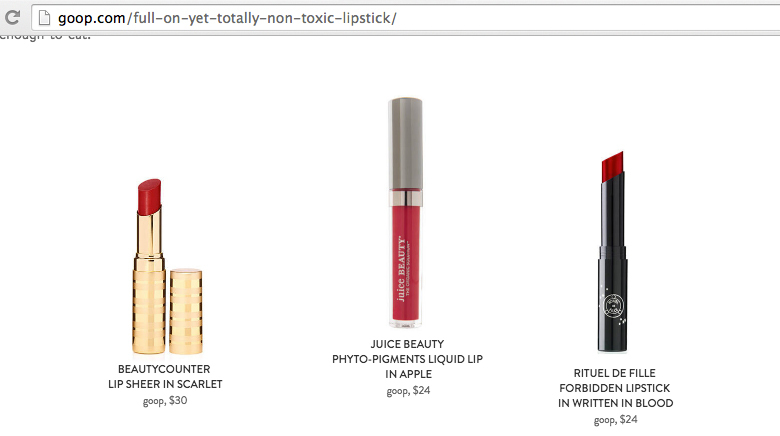 What will we find next on the shelves of the stores of a Food Babe advisor? Mark Hyman Facebook and product screen snapshots are used in strict accordance with Title 17 U.S.C. Section 107, commonly known as “fair use law”. This material is distributed without profit with the intent to provide commentary, review, education, parody, and increase public health knowledge. Mark Hyman “rear view mirror” illustration by Mark Alsip/Bad Science Debunked. Used under parody/education provisions of Title 17 U.S.C. Section 107, commonly known as “fair use law”. This material is distributed without profit with the intent to provide commentary, review, education, parody, and increase public health knowledge. When we last visited Mike Adams’ NaturalNews.com, we learned a terrible secret. The natural-living web site was found to be selling a product that contained sodium hydroxymethylglycinate, a “formaldehyde-releasing” compound that he warned us to avoid, on pain of a cancerous death.1 Like so many of the pseudoscientific “health” sites on the web today, Natural News’ merchandise often contains the very same chemicals the vendor says willl kill you. And now, for Adams, it’s going to get worse. A lot worse. The anti-GMO “Health Ranger” is promoting GMO products on NaturalNews.com. The Natural News story that admonished readers to avoid formaldehyde releasers1 was penned by regular contributor Danna Norek, who’s written over 70 articles for Mike Adams. At the conclusion of each of these articles, Mike Adams heaps praise on the health benefits of Norek’s own AuraSensory’s product line, and sends readers off to her web site to load up on her merchandise. What Mike Adams doesn’t mention here are AuraSensory’s Unscented Natural Soap, Acne Soap, and Natural Body Soap, all of which are made with soybean oil.2,3,4 Because almost all soy (~95%) in the United States is GMO,6 this shouldn’t have come as a surprise to anyone who bothered to look. I contacted AuraSensory while writing this article and they stated that their provider “pretty much confirmed that it was likely a GMO source for the soybean oil“.7 This isn’t anything to be ashamed of. There are thousands of studies backing the safety of GMOs. I am in no way impugning the purity or safety of AuraSensory products in exposing the hypocrisy of Mike Adams and Natural News, and hope AuraSensory won’t be punished by association. This is just another example of how the public is being duped into following a self-proclaimed Health “Ranger” with a broken moral compass. If you follow Natural News on Facebook, now is a great time to click the “Unlike” link. Opening graphic by Mark Alsip/Bad Science Debunked using elements in strict accordance with Title 17 U.S.C. Section 107, commonly known as “fair use law”. This material is distributed without profit with the intent to provide commentary, review, education, parody, and increase public health knowledge. “Health Ranger”. Adams’ web site, Natural News, regularly publishes supermarket tabloid-style articles on topics such as life on Mars being wiped out by ancient aliens, World War III possibly already being underway, and both 9/11 and the Sandy Hook massacre being hoaxes. And who can forget this side-splitting video1 of Adams and a puppet expressing (in song) their scientific illiteracy about GMOs? But there’s a serious, darker side to The Ranger. In addition to spouting medical misinformation that could actually cost real human lives, such as the well-debunked view that vaccines are dangerous and pushing ineffective holistic cancer cures, Mike Adams is selling merchandise that contains the very same chemicals he claims will kill you. One of those devious, hidden formaldehyde sources, according to the Health Ranger? Sodium hydroxymethylglycinate. 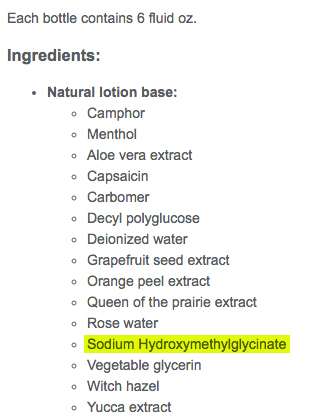 This compound is sometimes used as a preservative in cosmetics, much to the chagrin of astroturf “consumer advocate” sites quoted by Adams, such as the Environmental Working Group (EWG), which warns that sodium hydroxymethylglycinate can slowly release formaldehyde into cosmetics over time. Why might this matter to Mike Adams? As Minnie Mouse said to Mickey on their wedding night: Eek! There it is in all its glory… sodium hydroxymethylglycinate. 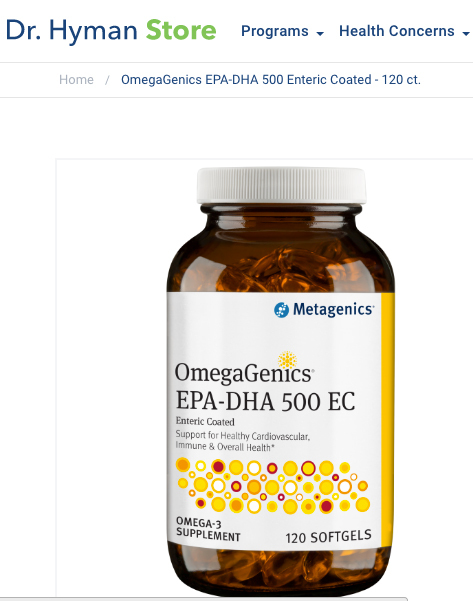 The chemical compound Natural News links via formaldehyde to cancer, neurotoxicity, and immune system disfunction is a prominent ingredient in the company’s merchandise. If Mike Adams is a health “Ranger”, his (moral) compass doesn’t appear to be pointing due north. A disturbing trait of snake oil salesmen is how openly they run their con games while going unnoticed by their marks. 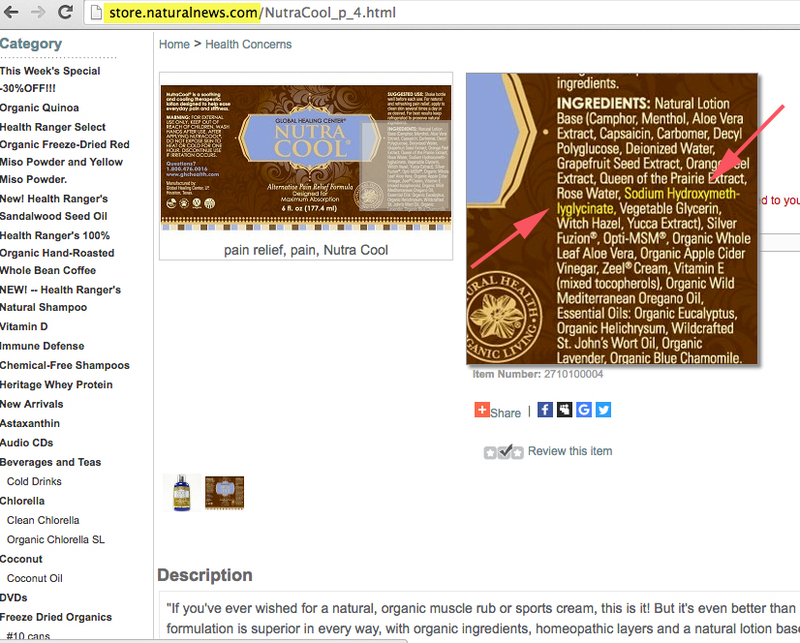 You might forgive an unsuspecting customer for missing the sodium hydroxymethylglycinate buried deep on a web page, but Natural News also proudly displays the additive on the product label, complete with a magnifying glass feature. You can’t miss it if you try. See the following image (click to enlarge). This is just one of many (upcoming) examples of a web site/Facebook page misleading nearly two million followers. Chuckle over Natural News’ featherbrained conspiracy theories, yes. But don’t fall for or spread their potentially fatal lies about the dangers of vaccines and GMOS (read: they’re safe). And by all that’s holy, don’t spend your hard-earned money in the Health Ranger’s online store. When an unqualified, self-styled “expert” such as Adams tells us to avoid “formaldehyde-releasing” cosmetic ingredients and then sells eight ounces of the very same for $29.95–shame on us for buying. 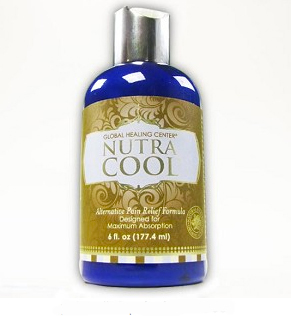 Natural News and Mike Adams/Health Ranger screen and product snapshots are used in strict accordance with Title 17 U.S.C. Section 107, commonly known as “fair use law”. This material is distributed without profit with the intent to provide commentary, review, education, parody, and increase public health knowledge. Opening photo parody/illustration by Mark Alsip/Bad Science debunked. Produced with elements (c) Natural News; also used instrict accordance with Title 17 U.S.C. Section 107, commonly known as “fair use law”. This material is distributed without profit with the intent to provide commentary, review, education, parody, and increase public health knowledge.